Dying eggs is a time honored tradition at Easter but for this project we thought we’d give this idea a rainbow ombre twist. 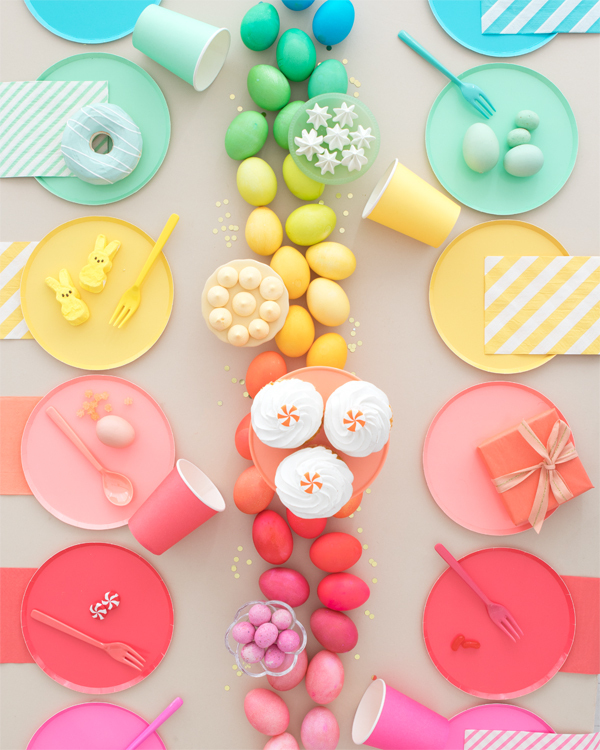 It’s perfect for a show-stopping centerpiece at a rainbow themed Easter party! 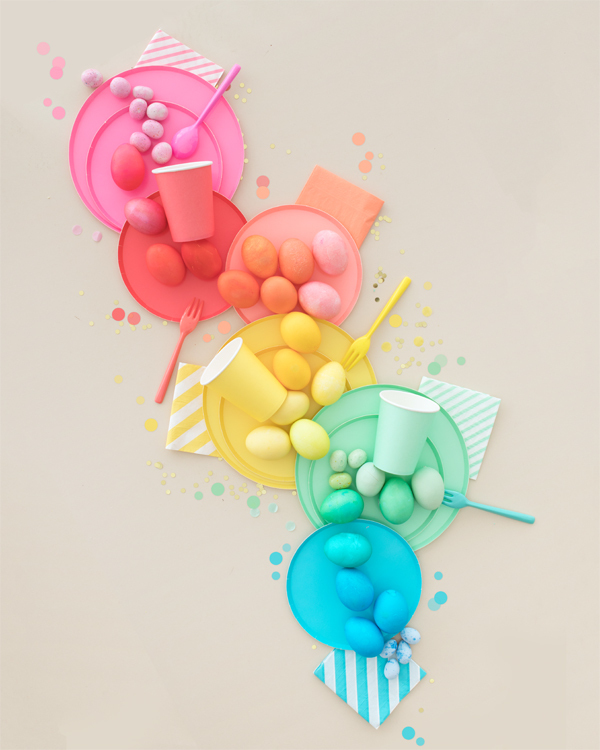 Don’t forget to complete your table with the full spectrum of colored partyware. Read on to find out how to create this stunning ombre effect! Step 1: Hard boil 3 dozen eggs. Step 2: Mix 1 teaspoon of vinegar with 1 cup of water and 7 drops of food coloring. Begin with the primary colors, red, blue, green and yellow. 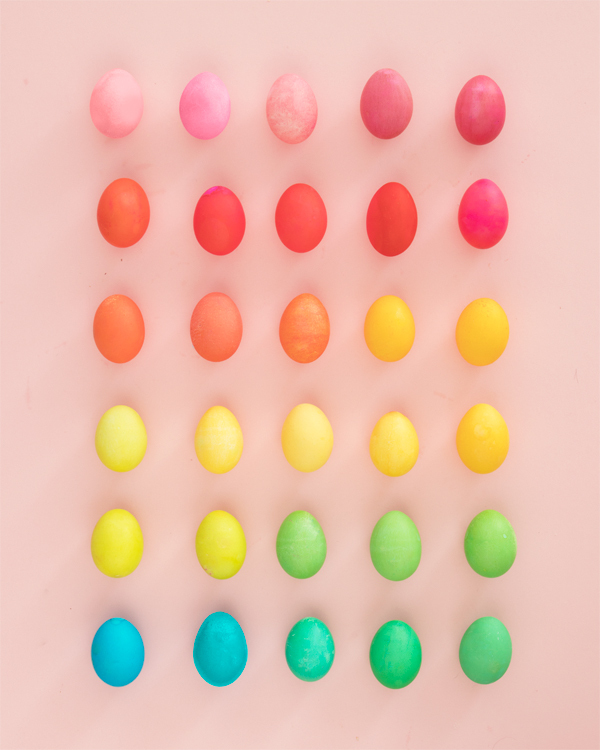 Place 1 egg in each cup and lift each egg periodically to check on the color you desire. We used this handy color mixing chart to get the exact colors for the ombre effect. Step 3: Dye three eggs in each color and let dry completely. Arrange your eggs in the center of the table and you’re done! SHOP THIS POST: Neon Rose plates, Coral plates, Neon Coral plates, Happy plates, Mint plates, Sky plates. Neon Rose cups, Coral cups, Neon Coral cups, Happy cups, Mint cups, Sky cups. wow it’s so colorful and pretty plz follow me!!! This is so cool! Always love your ombre centerpieces! Its awesome, let me try this at my home. It Will be so exciting will share a photo with you of Egg Centrepiece.